Let me tell you about the second fountain pen I bought -- The Monteverde Artista Crystal -- with a transparent body. First off, I didn't really know a Lamy from a Pilot. I was just interested in all the pens. My personal taste hadn't developed yet, and I was open to anything new that crossed my path. The Monteverde did just that one day on JetPens when I was browsing. It had been a rough week, so I made an impulse decision to reward myself. You do that too, right? My first impressions of the pen were very positive. It came in a nice box and wrote like a dream instantly. I've had the pen for over a year now, and it still surprises me by how pleasant it is to use. The appearance of the pen isn't very special when you see pictures of it online. It's much more striking in person. It's smaller than you might guess -- The same length as a Retro 51 when it's capped. Because of the size, I typically write with this pen posted. That seems to give it the perfect weight for my hand. The chrome accents set the pen off and make it look more professional than other demonstrators in the price range. One of the things I noticed right from the start was the transparent feed. All of the other fountain pens I use have black or dark colored feeds. I was delighted to see the feed change colors as the ink absorbed into the feed along the tiny channels. The nib is one of my favorites that I own. Keep in mind, I have a limited collection, and I'm sure there are much better nibs out there, but I really enjoy this nib. 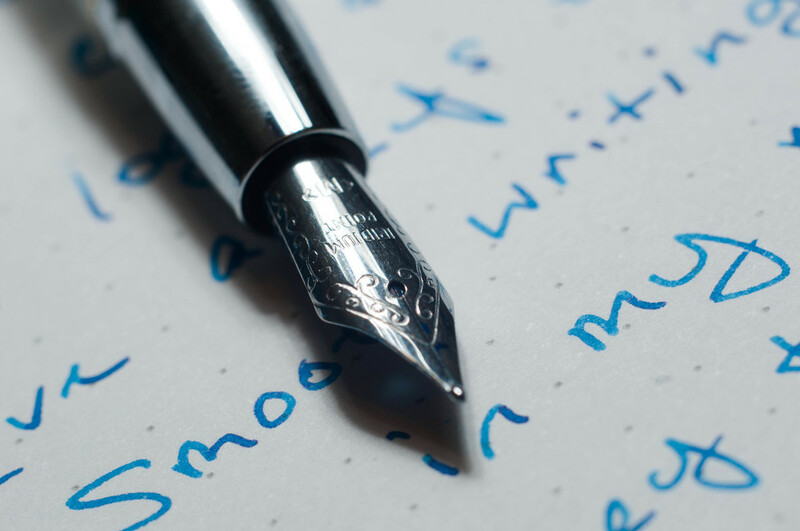 Writing is smooth, flow is consistent, and line width variation is subtle. When using a blue or lighter ink like Kon-Peki, you can see how the nib behaves with different strokes. My only complaint is that sometimes the flow seems to dry up and the only way to fix it is to twist the converter a bit to force the ink into the feed. I'm not sure if this is a fault in the converter or the feed because I've never used any cartridges with this pen. It's a minor problem, and it hasn't bothered me enough to do any more research or troubleshooting. Because of the chrome accents, the part of the pen that I grip (the part closest to the nib) has a nice weight to it. Plastic pens are usually very light, but this pen has good weight in the right place. The chrome accent on the converter is also a nice touch, since it's a demonstrator body. Cleaning this pen is extremely easy because it completely disassembles. The nib unit unscrews from the body, and then the feed unit separates from the nib. The converter also disassembles completely, which makes cleaning and drying much quicker. To sum it all up, this is a good pen. Now that I own more fountain pens, I don't know that I would buy one of these after just seeing a picture online. But I think I'd be missing out if that were the case. A major con for me was that only one nib size is available (medium). I don't mind so much now -- it's part of the pen's personality. The only other con is the price, but I think the sub-$40 range of this pen is fair for the quality of materials and the experience. The Monteverde Artista Crystal is available on JetPens in four colors, but I think transparent is the right choice. Posted on December 13, 2013 by Jeff Abbott and filed under Fountain Pens, Monteverde, Pen Reviews.